What he didn’t cover, however is the brake pad change, which is actually pretty simple, but I saw that no one had done an article on it yet so I figured I would snap a few pics and do the writeup myself. Total time required: approximately 30 min to 1 hour. I probably spent 30 min lifting the car and removing/replacing the wheels carefully. About 15 min actually working on the brakes, including stopping and taking pictures. With practice I am sure you can do the whole brake pad swap in even less time. 1. First before you lift the car, loosen the lug nuts on the wheels that you will be removing, using the lug wrench or a 19mm socket and breaker bar. If you are just changing the front pads then you could do one wheel at a time. I was going to be doing a full brake fluid flush and speed bleeders install at the same time so I loosened all 4 wheels. Safety first! If you are not sure what you are doing seek help from an experienced friend or take it to a shop instead. 3. Remove the wheel. Put the lug nuts in a safe place where you won’t lose them or trip over them. 4. Now you have access to the brake rotor and caliper. There are two 14mm bolts on the back side of the caliper that hold the caliper to the rotor and thus clamp the brake pads in place. Use your ratchet and socket to loosen the top bolt, and remove the bottom bolt. 5. You do not have to remove the top bolt, as now you can simply swing the caliper up and away from the pads, pivoting on the loosened top bolt. 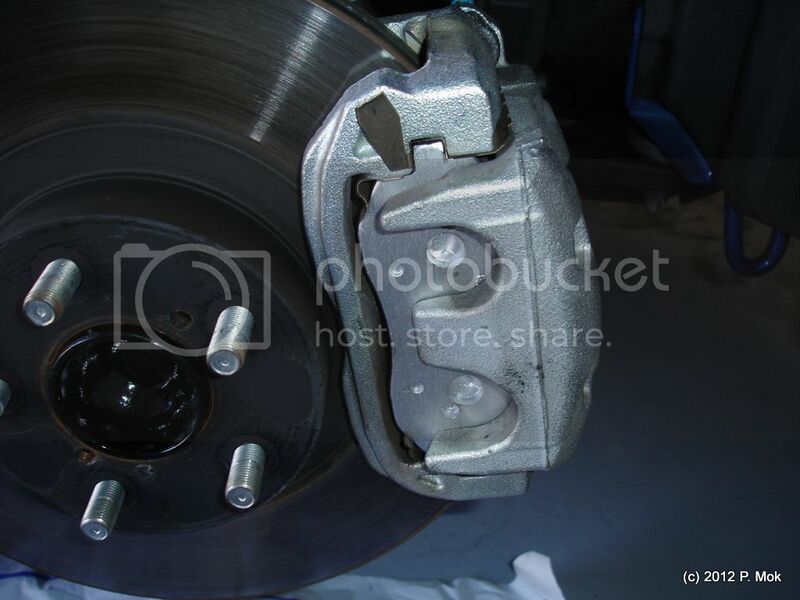 Note that the caliper is still connected to the brake lines and you should take care not to damage the lines. Now the 2 pads (one on each side of the rotor) are exposed and you can simply pull them out and away from the rotor. 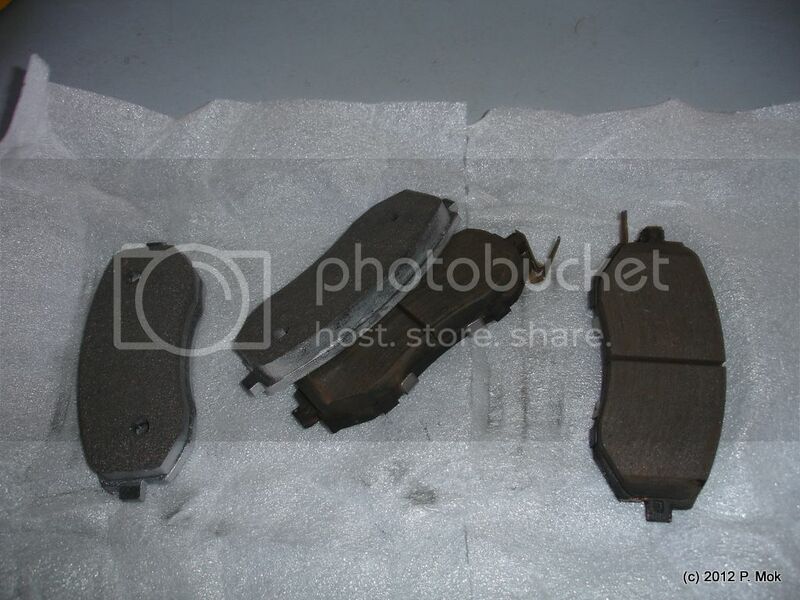 I held the caliper up with one hand and removed the pads with the other, they came out easily. Take note of their positioning as you will need to put the new pads in the same way. Some clips remained in the rotor/caliper as I removed the pad, they help to align and hold the pads in place. I left those in the caliper; if you have replacement clips with the pads you bought you can remove and replace these. At this time you can also inspect your rotors and see if they are worn, scored, or otherwise showing signs of severe wear. Replacing your rotors or having them refinished may be necessary, but that is beyond the scope of this particular writeup – I was upgrading my pads at 3000 miles to get ready for a track day, so my rotors are fairly new and not in need of replacement. 6. New pads are pictured on the left, old pads are on the right. My OEM pads are practically new so they have plenty of thickness left. I am upgrading my front pads to Carbotech XP8s which are a racing/track pad and will hang on to the OEM pads as a backup. Note that the OEM pads have additional clips and shims attached to them that the XP8s do not have. The clips help you recognize when your pads are worn out and need replacing by scraping against the rotor when the pad material is worn down to the point that the clips make contact with the rotor. The shims are supposed to help reduce brake noise or squeal. If you are replacing your pads with OEM or street-use pads, you will probably want to install the clips and shims on the new pads to retain these functions. You would also apply some anti-squeal brake grease between the shims and the pads. Make sure you do not put any grease on the pad material or the rotor – only on the back side of the pad. At CSG Mike’s advice I am skipping the clips and shims and grease because they are not really needed for race pads and the grease will just smoke and burn off at high track temperatures. 7. Place the new pads back into place and gently lower the caliper. If your old pads were badly worn, you will now notice that the caliper pistons are too far extended to allow you to lower the caliper over the pads. If so follow the next step to depress the pistons. 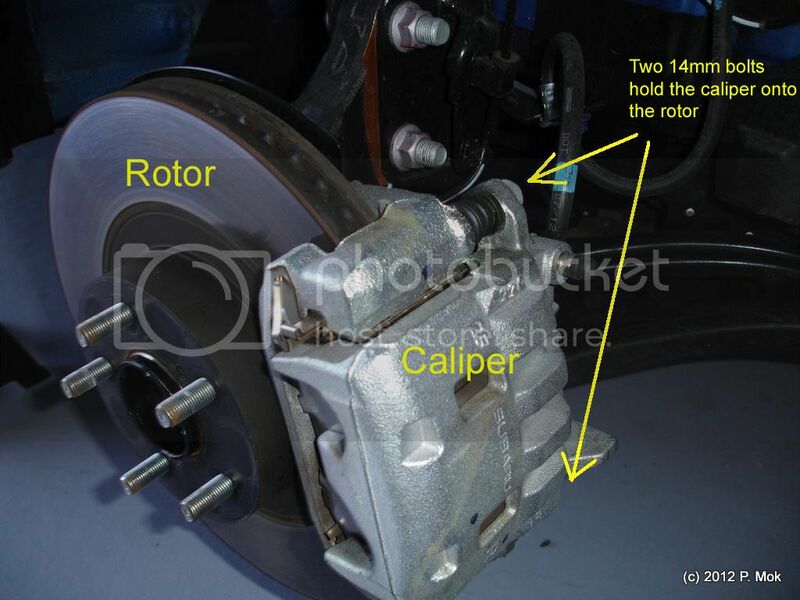 If you are able to lower the caliper all the way then skip the next 2 steps. 8. 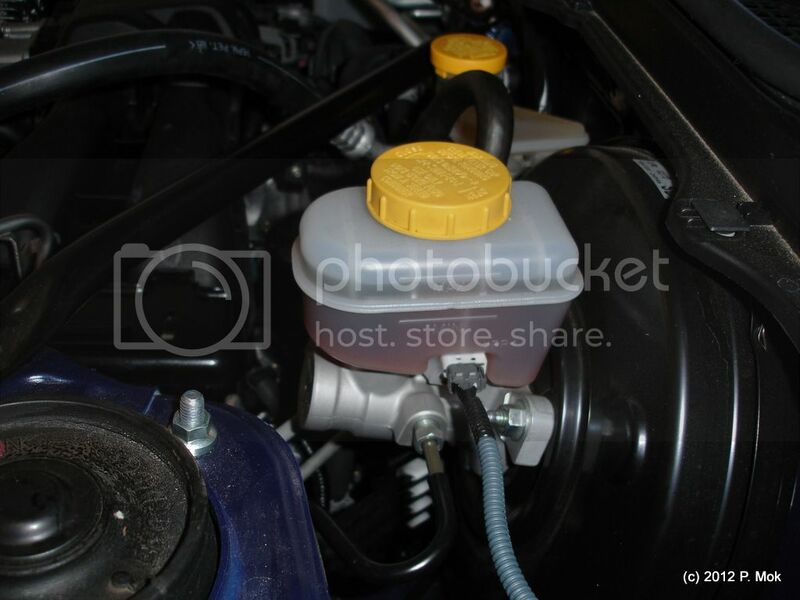 At this point, remove the cap from the brake master cylinder/reservoir (under the hood). Now you are going to compress both pistons. You can do this one of two ways. If you have a C-clamp you can place the used brake pad against the pistons and then tighten the C-clamp on the caliper and pad to compress the piston. Or, you can use the lug wrench handle across the two pistons, and push on it with both hands. Use a rocking motion from one piston to the other until eventually they are both fully depressed. You can brace the caliper against the strut so that you can get a decent amount of force onto the caliper. 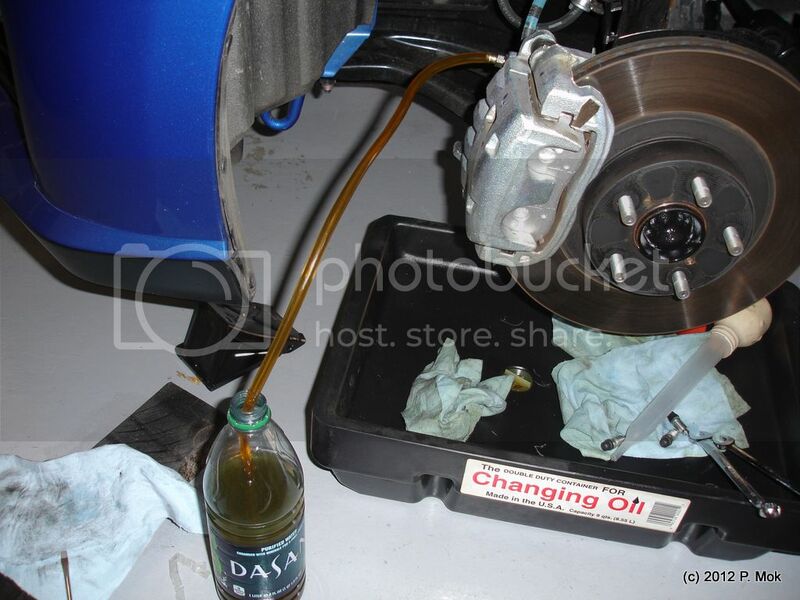 While you are doing this, it is important to periodically check the level of the brake fluid in the reservoir. As you push the pistons in it will push brake fluid back into the reservoir. Brake fluid is extremely corrosive and will eat paint -- you don't want it to overflow and splash around in your engine bay. If you do spill any fluid, spray down the area with water immediately and wipe it up with paper towels or rags. 9. If you cannot get the pistons depressed, you will need to release pressure (and fluid) from the system by opening the caliper bleed screw (with a hose attached and appropriate catch bottle ready – you will need a small 10mm wrench). This will allow you to easily depress both pistons, BUT will absolutely necessitate a bleed of the brake system afterward. See f1point4’s article on bleeding the brakes. You may also have to follow this procedure if depressing the pistons causes the reservoir fluid level to get too high, but what I would do is use a turkey baster to suction off the excess fluid and drain it into a spare bottle or can (take care not to drip brake fluid on the paintwork). 10. Now the caliper can be lowered gently over the pads, and you can replace the lower 14mm bolt, and retighten the upper 14mm bolt. Don’t over tighten these bolts. 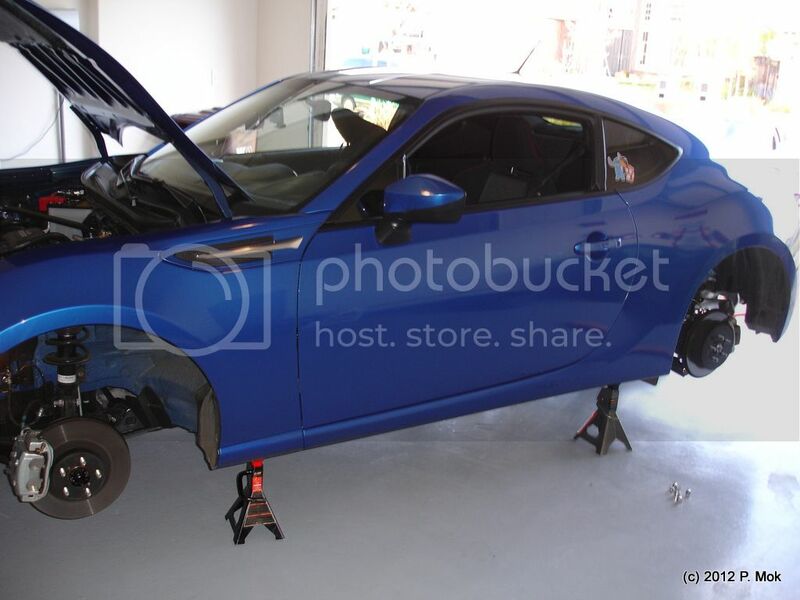 According to the FR-S service manual the torque should be 19 ft-lbs. The space is a little too tight to fit a torque wrench, so I just approximated it by feel. 11. Other possible steps: since you’ve already got the wheel off and you’re there, you can install speed bleeders, stainless steel brake lines, and/or bleed or flush the brake fluid. Again, refer to the previous article by f1point4 for directions on any of these. 12. Now you can put the wheel back on and secure it with the lug nuts. Hand tighten them (in star pattern) and then lower the car/remove the jack stand. Once the wheel is fully loaded on the ground, tighten the lugs to 89 ft-lbs using a torque wrench. 13. Repeat the process described in steps 3-12 for the other side. 14. If you are replacing pads on the rear as well, the steps are basically the same. The only difference is that you only remove the lower 14mm bolt, and I found that the caliper will swing up without needing to loosen the upper bolt, to get to the pads. 15. Very Important!!! Once you’re done installing all the pads, start the car and pump the brake pedal a few times to make sure the pistons/pads are fully primed and ready to go before you drive off. 16. In a safe area, road test the car to make sure the brakes work properly. Follow the bedding procedure as recommended by your brake pad’s instructions. Typically this involves incrementally increasing speeds and applying hard braking pressure until the brakes get nice and hot, then letting them cool off. Make sure you do this in a safe area, i.e. not on city streets filled with traffic. If you spot any inaccuracies or have anything to add, please let me know! Sorry for the loss of the images in this thread, Photobucket has changed their policy about external hosting. Last edited by PMok; 08-21-2017 at 03:39 PM. Excellent DIY! Definitely useful for anybody that's doing pads for the first time! I want to emphasize step 15 ... The brake pedal will go to the floor several times, if you have compressed the pistons to install the new pads. You will have no stopping if you just drive off without doing this step. Are you still able to use the C clamp on the rears? Wouldn't the rear pistons need to be 'screwed' in using a tool because of the emergency brakes? Or do Subarus not work that way? The parking brake is a drum brake inside the hat of the rear rotors. 14. If you are replacing pads on the rear as well, the steps are basically the same. The only difference (I am told, as I didn’t replace mine this time) is that you would remove both 14mm bolts instead of just the one, and pull the caliper off to get to the pads. 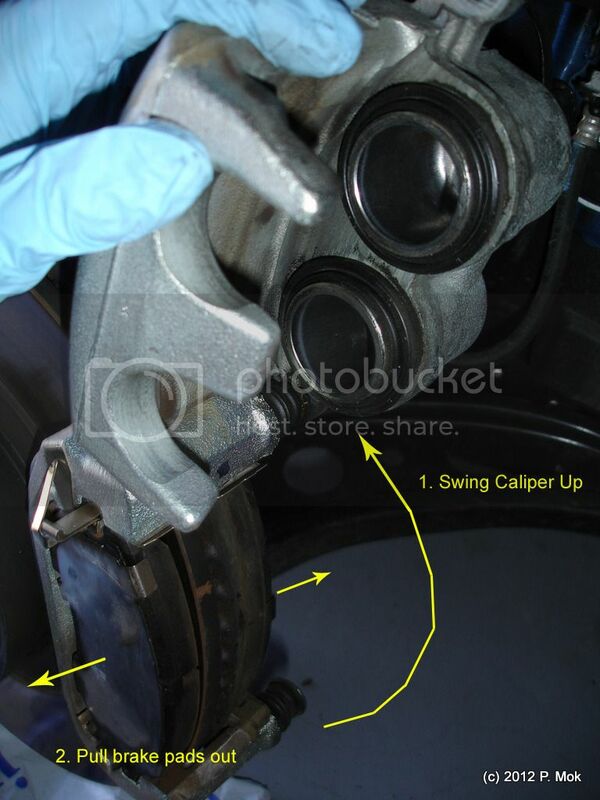 Make sure you support the caliper in some way so it isn’t just dangling off the brake line. I actually replaced all the pads this weekend, procedure for the rears is almost exactly the same as the front, and only the lower bolt needs to be removed and the caliper swung up the same as the fronts. All the same cautions apply - pump those brakes up before moving the car!!!! Great detailed write up. Thanks for the effort. The only thing I d add is if you have a way of pumping the brakes before step 10, I.e. put the bolt back in, finger tight, then pump the brakes and hold the brake pedal down while someone else torqued/tightens the caliper mounting bolts, you will have your caliper perfectly aligned on the center line of your rotor. Thanks for writing up this DYI. Worked perfectly to change the front pads on my BRZ. I have a question regarding the metal shim on the original pads. I did not transfer those to my new Ferodo pads. Any problems not transferring those? Thanks in advance for the reply. The shims are supposed to help reduce brake noise or squeal. If you are replacing your pads with OEM or street-use pads, you will probably want to install the clips and shims on the new pads to retain these functions. You would also apply some anti-squeal brake grease between the shims and the pads. Make sure you do not put any grease on the pad material or the rotor – only on the back side of the pad. At CSG Mike’s advice I am skipping the clips and shims and grease because they are not really needed for race pads and the grease will just smoke and burn off at high track temperatures. I think the only effect of not having the shims on is you may have more brake squeal/noise. Thanks for the response. Great write up. Excellent. Thanks a lot for this article.